Check out our latest news and learn more about Hollowscene and their musical project. For any question, please visit our Contact Page and fill in the form (or send us an email). Have a good reading! The officiali release for our Hollowscene album has been finally set for the 2nd of June 2018. 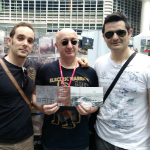 In the pic on the right you can see Massimo Gasperini (Black Widow Records) holding the new CD in his hands. Matteo Paparazzo (drums) is on the left and Tony Alemanno (bass) is on the right. The album (named after the band name) contains seven tracks and features the Broken Coriolanus concept that spans the first five tracks of the album: Welcome to Rome, A Brave Fellow, Traitor, Slippery Turns, Rage & Sorrow. The last two tracks are The Worm and a cover of The Moon is Down (Gentle Giant). Welcome to Rome has also been released for preview on Youtube and you can listen to the full song here. The Worm is a song of ours that was originally composed in the 90's and that we reissue here with new instrumentation and in an extended form (the original version was shorter). The Moon is Down was introduced as a tribute to our bass and drums players who run a Gentle Giant tribute band on their own. By the time we post this, many reviews have already appeared and they are very positive and encouraging. Here are the links to a couple of them: Progarchives, ProgBlog, MetalEyes, but there are really many more around. In May 2018 we signed for Black Widow Records, a well-known and flourish Italian record label specialized in progressive rock music. We are very proud that our work caught the attention of Black Widow. 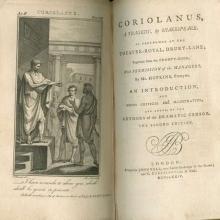 Our Broken Coriolanus was really encountered with great enthusiasm. Now that the album is completed and the graphics are mostly done, we can assure that the album will be released in May/June 2018 in both digital and CD format. The album will also be released in Vinyl format (September/October 2018). After a lot of reasoning we came up to the conclusion to name the album after the name of the band, so it will be titled "Hollowscene". 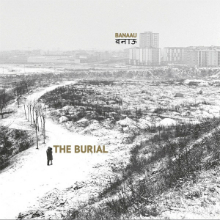 As someone already noticed, the CD front cover art will bear the same picture that appeared for "The Burial". This was made to make clear that, despite the name change, we are still the same band. We are currently working on a new album that will feature our musical transposition of Shakespeare's tragedy "Coriolanus". This "concept" will constitute the core of the album. It will also include "The Worm" (based on text by E.A. Poe) and a cover of a famous song by Gentle Giant (this as an homage to our bass and drum players, who run a Gentle Giant tribute band). The "concept" itself will be titled "Broken Coriolanus", a sort of cross reference with the Waste Land by T.S. Eliot. It will tell the story of this hero, from glory to death, through five tracks that highlight the most important moments in this tragedy. This is a story that is indeed very contemporary in both its development and meaning. The album is planned for 2018 and will be published by Black Widow record label in both CD and Vinyl format. Here is the presentation video we prepared for the FIM 2016. Therein you can get to know our band members: Andrea Massimo (Guitar & Vocals), Elton Novara (Guitar), Lino Cicala (Keyboards), Andrea Zani (Keyboards), Tony Alemanno (Bass), Matteo Paparazzo (Drums). This video has been made in July 2016 by Demetra Fogazza, Roberto Carlo Ranzani, Chiara Vanoli. Special thanks go to Maria Macchi who gave us great support when setting up the location and the equipment. It's incredible how many work there is behind every single scene. The music in the background is a selection of the instrumental parts in "Unreal City"... The location itself looks pretty unreal too. It is an abandoned madhouse located near Milan (Italy). And, yes, after filming this one we were fully covered up with dust! Ooops... It seems that your browser does not support the audio element! We would also like to thank our cover-art designer Alice Mangano that put a lot of time and love in designing our cover art and the Banaau logo. FIM is an International Music Fair held in Italy. It is an important event for either indipendent artists and record labels. Banaau will attend the 2016 edition and perform on the Main Stage on Sunday 11th September from 13:00 to 14:00 PM. They will perform "The Burial" and probably give some hints on their future projects. There will also be an interview at 15:45 where Banaau will speak about their musical projects and future releases. Sunday will be entirely dedicated to prog music with national and international guests taking their turn on stage. And there will be other important events too... On Saturday Steve Hackett will be at the FIM for the FIM Awards 2016 to receive the "Legend of Rock" award. Click here for more info on FIM and the numerous events. If you want to support us, please visit also our Kickstarter Project. We need your support to get in touch with record labels and submit our project. Up to now we received much appreciation and interest for our artistic work. Now it's time to move on and get in contact with record labels that would produce and distribute our music. We are proud to announce our line-up that will perform at the FIM 2016. 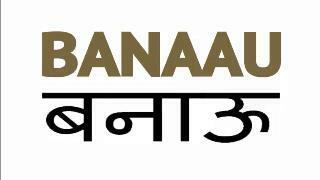 As you can see from the pic posted here, Banaau are currently formed by six musicians. 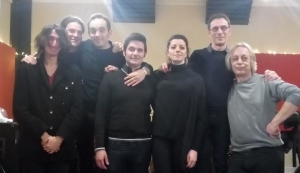 They are, from left to right: Andrea Massimo (guitar and vocals), Andrea Zani (keyboard), Lino Cicala (piano & keyboard), Elton Novara (guitar), Tony Alemanno (bass & bass pedal), Matteo Paparazzo (drums). As of 2017 the line-up has been extended to seven, including now the Flute played by Demetra Fogazza This will be the formation you will see in our future events and that will work on future projects. 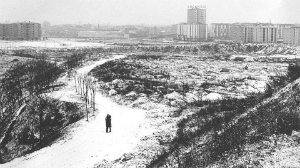 The cover art for The Burial dislpays a black and white photo. This picture was taken back in 1961 from Monte Stella (Milan - Italy) by photographer Maestro Ernesto Fantozzi. Monte Stella is a small artificial hill that once was in the suburbs of Milan (and you can see the "growing" town in the background). It is made of debris caused by the WWII bombings of Milan that were collected in the outskirts of the town and then coverd with earth (and, nowdays, grass and trees). This, coupled with the snow-covered landscape, has a strong correlation with the main theme of The Waste Land and the idea of a physically and morally devastated world. And what about the two lovers standing in the barren landscape? Will their love save them? Will they and their feelings be swept away by the ever-growing "modern" world? These are, in the end, the questions that The Waste Land poses to ourselves and this is why we found this picture very appriopriate for The Burial. Due to size restriction, on the cover art the image is square. To appreciate this picture in all of its beauty, you can check it here where it can be seen full size. We thank Maestro Ernesto Fantozzi for giving us permission to use his photograph for our project. We like having some gadgets so that our followers can always take Banaau with them! After the first run of Banaau pins was sold out, we decided to have some different gadget for you... 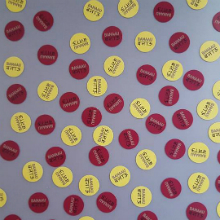 Here are our magnets. You can place them almost everywhere and we thought them especially as refrigerator magnets. They come in two colours (as you can see in the picture). These are usually given as a free gift to people attending our special events. Additionally, we just completed our second run of Banaau pins. The new pins come in the same colours as the magnets and are made by a NPO (Non Profit Organization) that employs and takes care of disabled boys and girls. This organization is named "Lo Specchio" (The Mirror) and you can learn more about them here. They also have a Facebook page that you can find here. In April 2016 we filmed a short clip for our Kickstarter project page. That same clip constitues the basis of the longer clip that will be streamed at FIM 2016 to promote our musical project. 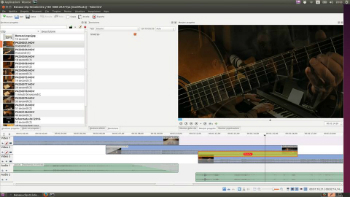 It is amazing how many hours are needed to put together a two minutes clip! Setting up the location, filming, editing, take a lot of time and passionate work. For this reason we would like to thank all the people that dedicated their precious time and effort to support us. We think they really did a great work and are proud to have people and friends that help us so much. Special thanks go to Francesca Lollo, Roberto Carlo Ranzani, Aldo Totaro and Chiara Vanoli. We are now collecting pics taken during the shooting of this video and would like to setup a photo gallery as soon as possible. Here is the video that briefly describes our musical project. Have a good look! The release of the Burial has been an important step for us. However, there are still many steps to do to push our project further on. Getting to FIM (International Music Fair) is one of them. Why? Beacause this will give us the occasion to perform our music in front of a dedicated audience and to get in contact with important record labels that would, in turn, be interested in this (The Burial) project and/or in other musical projects we are currently working on. Getting a slot at FIM requires money, and there are many other things that need financial support too: getting a band together, reharsal rooms, are just two small examples why we need your support. We do believe in the importance of this musical project. It's not simply "helping a band promote its music"... It's helping this artistic and cultural project grow. Head to our Kickstarter Project page to learn more!